For Ernie Haase and Signature Sound, quartet singing is much like the ultimate team sport, and they prepare for their stage performances as if each was a basketball game. Ernie Haase, founder of the high-energy gospel group and the veteran tenor for The Cathedrals as well as a life-long basketball player, is the coach and team leader who wrote the playbook for Signature Sound according to his vision of what a great gospel-singing group should be and chose his team members for the strengths they would bring to their specific position. He wanted a quartet that, just like a basketball team, played together. "When you take five guys who work real hard and believe in each other and are philosophically on the same page, you become a force to be reckoned with." On the Signature Sound team, just like on the basketball court, every man plays his part. "The point guard is like the coach on the floor." Ernie maintains. "He can see what needs to be done and how to get each man involved. On our team, Doug Anderson, who actually played basketball at Purdue University, is our point guard. You never have to tell Doug what to do." He describes Ryan Seaton as the assist man. "I may score with 'Oh What A Savior' or 'This Could Be The Dawning,' but if Ryan was not singing under me-assisting me with his big lead voice-then I don't think it would have the same impact and maybe not score with the audience." The man with the big voice, Tim Duncan, Ernie describes as the little man of the team. "He reminds me of Mugsey Boggs," Ernie laughs. "He was so small, yet he could dunk the ball and everyone wanted to see the little man dunk. People come to hear our little man dunk those low, low notes." Piano player and resident funnyman, Roy Webb, is the group's rebounder. "I can count on Roy's quick wit to rebound the program if it gets a little stale," Ernie points out. "You can have a lot of scorers on your team, but if you don't have a rebounder, then you can never score enough." Ernie calls himself the "player coach" after one of the greatest who ever played basketball. "Back in the '90s when Magic Johnson made a comeback, he played and coached," he outlines. "I look at myself as that kind of guy. When I'm home, I become the general manager of the team, handling all the business affairs of the team." The 10-year veteran of one of the greatest quartets in gospel music, the Cathedrals, Ernie wanted a group that was all 21st Century in image and attitude but whose stage performance and material borrowed liberally from the great groups of the mid-20th Century, such as the legendary Statesmen. "I think what people see in us that they also saw in the Statesmen is five guys who love what they do and have fun doing it," he says. "We practice all the time, something Bill Gaither told me the Statesmen did in the early days. We definitely dress different than they did, but all in all, the language everyone understands that transcends cultures and races is love and laughter. We try to spread both." That is a philosophy the Evansville, IN native learned from his father-in-law, boss and renowned bass singer, George Younce, who endeared himself to audiences for 50 years with his wit and playful antics. "George loved to laugh and make people laugh-that's what everyone loved about him. I wanted to have a group that not only sounded tight and lived what they sang, but I wanted to have fun and bring joy to people's lives. I have always been a clown, and I wanted to sing songs and perform them in such a manner that lifted people up, giving them something to hang their faith onto after they leave the concert." Performing with George Younce and Glen Payne and the other members of the Cathedrals for a decade was the perfect training camp for Ernie, but when the Cathedrals retired in 1999, it was time for their young tenor to evaluate his future. He performed for a couple of years with George and another Gospel Music Hall of Famer, Jake Hess, and fellow Homecoming regular, Wesley Pritchard, as the Old Friends Quartet. Health issues sidelined both George and Jake, and Ernie began to assemble his own singing team. He looked to another quartet, Lighthouse, for the foundation of his team - Doug Anderson, Roy Webb and David Griffith, their sound man/bus driver, all of whom he knew from the past. "I worked with Lighthouse about a year before the Cathedrals retired," Ernie recounts. "I told Doug that if I ever started a group, I was going to call him. Ryan used to come and hear me sing when I was with the Cathedrals. He was about 15 years old when I first met him, but I can remember this really tall, skinny kid showing up and smiling real big all the time. Through the years, he sent me some songs of him singing, and we talked and I gave him advice about his vocal training. Ten years later, I called him and said, 'You ready to sing?' He said that was the call he had been waiting for." All that was missing was a bass singer, which they found in Tim Duncan, a former member of Poet Voices. "He was the only one we took a serious look at, but when he walked in, I knew he was the right man for the group." In addition to a love for basketball, which was a pre-requisite for Ernie's team, the members shared a vision for their image - spiked hair, big-knotted, short ties and infectious, high-energy shows. "We are who we are," he explains. "I tell people all the time, 'different hair/same heart.' We're just being ourselves. We may grow up one day, but not anytime soon." Although an ailing George Younce served as bench coach for the young team, they soon acquired another powerful mentor, Bill Gaither, affectionately known as the "Godfather of Christian Music." Not only did Bill find a regular spot for Signature Sound on his popular Homecoming concert tour and videos, where they quickly became fan favorites, but he signed them to his Gaither Music Group label. 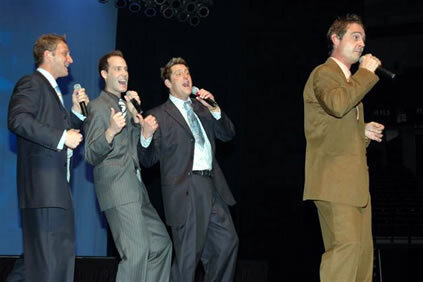 He also produced a full-length concert video and television special on the group, slated for a fall, 2005 release. "This video is our launching pad," Ernie proclaims. "We have the greatest message, and I want to share it with the world, and Bill Gaither has given us that opportunity." Like most successful businessmen, Ernie has a five-year plan for Signature Sound. "With this group, I've said, give us five years to make it together. We're still growing together, learning to breathe together, to phrase together , to make our tones together and to blend as a cohesive unit. We'll have a foundation in five years, then we can start building the house." That house will definitely be built on a foundation of faith, God's love and the spirit of George Younce. "The joy of the Lord is definitely our strength. We want to keep George's spirit alive by reaching people at their need. That's how we can best honor him. Emotions and happiness are just surface things, but joy runs deeper." he concludes.